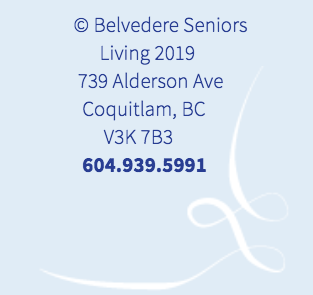 Commitment to "Care with Respect" is essential when applying for a position at Belvedere Seniors Living. Staff work together to provide a harmonious and well-organized approach to care of our residents. To contact us about Career Opportunities, email belvedere_hr@telus.net. All applications must be sent to this email. Acceptance of a resume will not guarantee an interview and/or employment. Belvedere Seniors Living reserves the right to select the applicants it chooses to interview for positions, and/or employment. Please visit our Volunteer page for contact information.